1716 Noah's Ark Plaque  - $185.00 : Red Bird Mission Crafts, Hand crafted art. 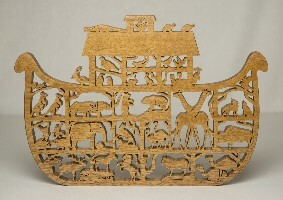 This Noah's Ark plaque shows the animals on the ark and is made in various types of woods. It measures approximately 11" tall & 16" wide.